From Orito we backtracked to the main road, which was under construction for a good stretch of the way to Hormiga, the only town of any significant size on the way to Ecuador. The lack of pavement made for slow progress, and we had to wait a few times in places where only one lane was open to one direction at a time. Along this road was a bridge that had been taken over by guerrillas years ago. The guerrillas basically killed anyone who tried to cross the bridge, dumping the bodies in the river. Many towns in Colombia, including the one where Lenin grew up, were accustomed to the guerrillas coming in several times a year to massacre the police and steal supplies. First, the electricity to the whole town would go out, announcing their arrival. Then, you would hear the bombs and gunfire. They would usually target police stations, and sometimes the entire police force in a town would be killed. Then, the guerrillas would rob everything they needed from the town, including food, ammunition, and medicines. The next morning, when there was daylight, people would come out, inventory the damage and see who had died. Lenin lost friends this way who were caught in the crossfire, or who had been too close to the police station when a bomb went off. The towns in Putumayo seemed to either be common victims of this type of warfare, or protected from it, depending on who lived in the town. Orito, for example, didn’t get attacked very much because most of the people living there were related or connected to the attackers in some way. Or, it could have been because the town was dominated by the oil industry and was heavily reinforced by military protection. El Tigre, on the other hand, just north of Hormiga, seemed to have a darker history of oppression by the guerrillas. It was chilling to think about what had occurred at the bridge while we crossed over the Guamez river outside of El Tigre. 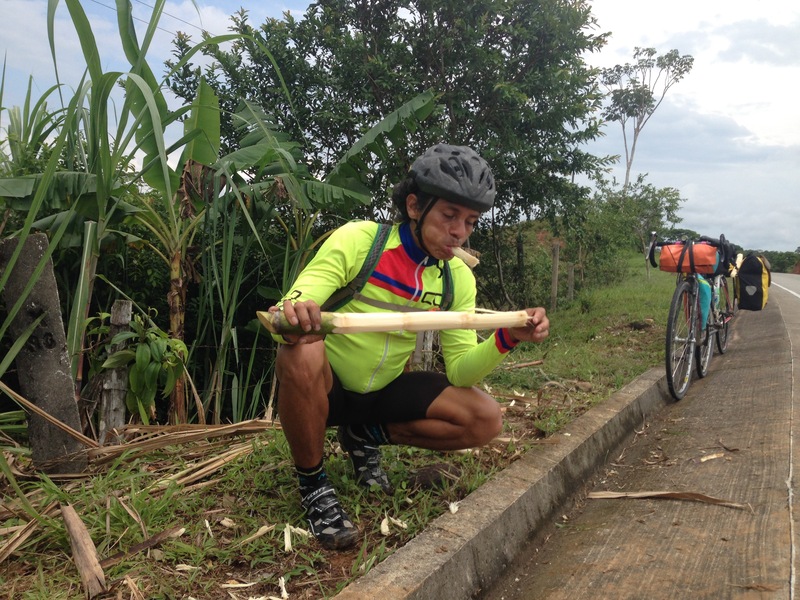 Lenin stops to eat sugarcane from a farm on the side of the road. 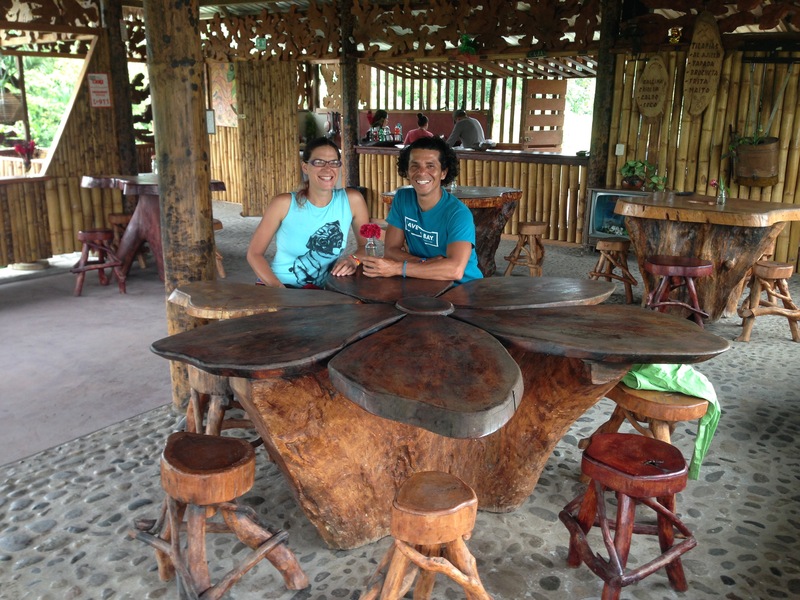 One of the best parts of riding in Colombia are the many delicious fruits that are so readily available everywhere. Guava was in season, and as we neared the Ecuadorian border, we passed hundreds of trees full of ripe guavas. We also passed sugarcane, and when we saw a farmer loading the back of his truck with freshly cut caña, Lenin asked if we could have some. Without hesitation, he shared four stalks with us, expertly removing the hard, outer skin with a machete. The last snack we bought before reaching the border was a turron de maní. This is a roll of panela that has been kneaded by hand to the point where it is a taffy, or nougat consistency. It is mixed with peanuts, making for a crunchy, sweet and salty treat that resembles a Payday candy bar. We made it to Ecuador! 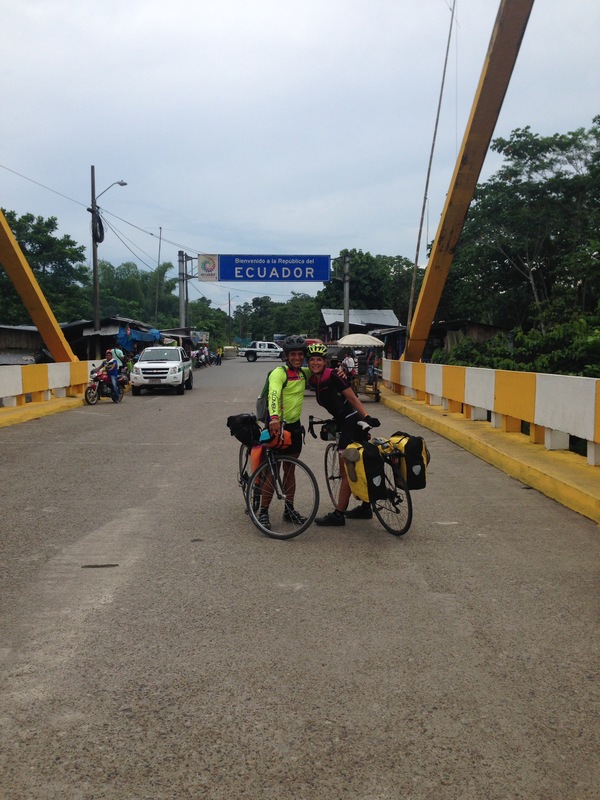 When we came to Puente Internacional, the bridge that crosses from Colombia into Ecuador over the Río San Miguel, we asked a policeman to take a photo of us. On one side of the bridge were Colombia police officers, and the other side were Ecuadorian police officers. The immigration office was still a few kilometers down the road into Ecuador, so after getting a photo from both sides by two different officers, we rode on to this office. Most of my border crossings on land have been between the US and Canada, where photography is always strictly forbidden. I thought it was novel to actually have the police officers take our photos at the border for us. We pulled up to the immigration office to get our passports stamped. Beyond this point, we passed cacao farms, more guava trees, and many properties for sale, as well as many abandoned houses. During the time when the guerrillas were most active, they would frequently cross over the border to hide out in Ecuador. The Colombian president at the time, Uribe, had a vengeance for the guerrillas since his father was killed by them when he was a boy. Disregarding the fact that this wasn’t his territory, he ordered the military to bomb the jungle, trying to find and kill the leaders of these guerrilla groups who were reportedly hiding in Ecuador. As a result, not many people live near the border, and there is a lot of abandoned property. 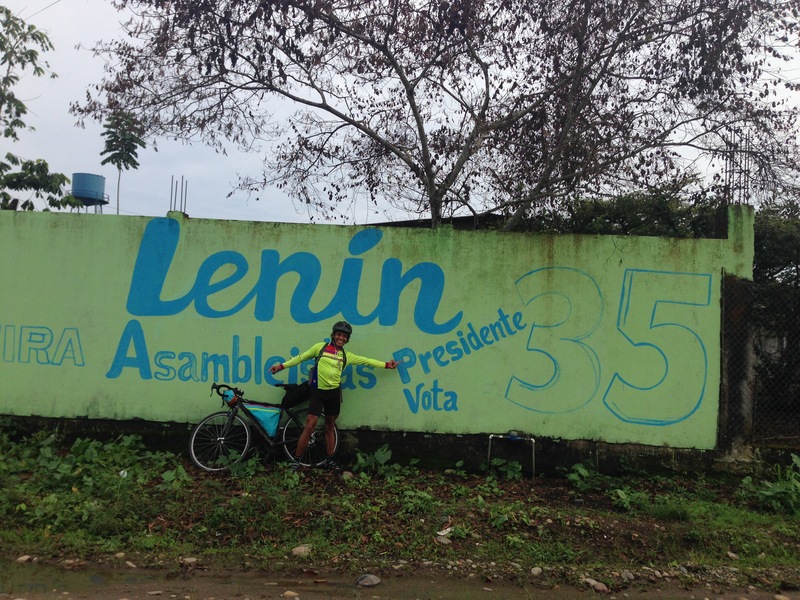 Lenin’s name is everywhere in Ecuador! When we got a little further south, we started seeing green murals painted with Lenin’s name on them in huge blue letters. Ecuador has recently had an election, and one of the presidential candidates was named Lenin. They actually need to hold another election because the results were so close, so it’s possible that Lenin may very well be the next president of Ecuador. Continuing to the south, we approached Lago Agrió, or bitter/sour lake. This town was originally settled by people who had migrated from a town in southern Ecuador called Loja and had named it Nueva Loja. However, when the big oil company, Texaco, started taking control of the area, they renamed it Lago Agrió. The town is not pretty, and it appears far removed from the beautiful jungle that we were surrounded by closer to the border. We had the contact info of a man from WarmShowers who lived in Lago Agrió, so we headed towards the address listed for him. We tried stopping at a few places to use a phone and call him, but nobody seemed to have a working phone we could use. Just after sunset and just shy of 100 kilometers from where we began in Orito, we came to the church where this WarmShowers host was supposed to be. At first glance, it appeared that nobody was there, but when we got closer, a pregnant woman stepped out of the darkness. She told us that the man who used to host people was the pastor, but he had left the church a few months ago, and she didn’t know where he had gone. We decided to go back towards the downtown and ask if we could stay at the fire station. The fireman who greeted us told us that they were understaffed, and the people working there were just covering for the actual employees while they went to a training in Quitó. He didn’t have the authority to let us stay at the station, so we settled for a cheap hotel around the corner. My birthday was the next day, so it was kind of like an early birthday present to splurge on a hotel, but I still felt guilty about spending $15 on a room (they use US dollars in Ecuador). While walking around to find food, we found another bike traveler. He was from Bogotá, and he may have been more talkative than Lenin. We were both very tired, but we listened patiently to his stories from the road before retreating back to our hotel.